Sometimes I feel that I don't cover enough stocks that live up to the namesake of this blog, fortunately for this post Guinness Peat Group is a true oddball. The Guinness Peat Group is a bit interesting, and I'd love to take credit for uncovering it, but I'm not the first blogger to write about it; Richard Beddard at Interactive Investor Blog called it a Bargain within a Bargain. I liked his post, but didn't think about them again until a reader mentioned the company to me, so thank you to the reader and Richard. There are a lot of different angles with Guinness Peat Group, but I want to keep this post narrow. It's easy to get lost in the weeds when looking at the company, but I think the investment really hinges on a few specific factors. If those factors go right an investor does well, if they go wrong the investment is a bust. Guinness Peat Group (GPG) is New Zealand conglomerate that maintains a listing in three countries the UK, Australia, and New Zealand. The company owns some companies outright as well as pieces of other listed companies. GPG had operated for years with the conglomerate model over the past few years earnings began to drop precipitously. The board of directors met last year and determined the best course of action would be to liquidate their investments and return the money to shareholders. I want to pause for a second here and state that as someone who invests in a lot of companies that should be liquidated this is far too rare of an occurrence. Too many managers pay lip service to shareholder value, if they acted on what they speak they would liquidate an underperforming business that's trading for less than liquidation value, or sell to a private buyer at a fair value. The company's 2011 annual report is excellent, the management letter clearly articulates the goal of the wind down, and what shareholders should expect. Management goes the extra mile and even breaks down liquidation value showing a simplified balance sheet. There are really two components to this liquidation, the value of Coats, and the value of everything else. 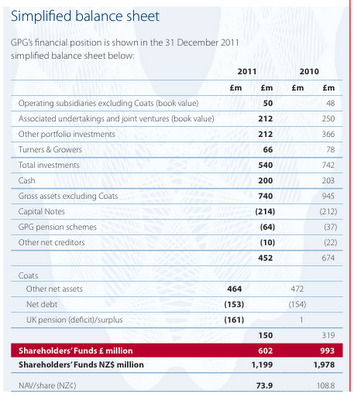 Coats is the largest holding of GPG with a book value of £150m, £46m in profit, and £97m in cash from operations. Currently GPG trades as if Coats is worth nothing, management realizes this is crazy and is working to expose Coats through the liquidation. The end result will most likely be all of the periphery investments sold with the cash returned and Coats being the only remaining GPG investment. On a book value basis GPG is worth £36p per share. This statement isn't exactly correct though because since the finalization of the 2011 annual report cash increased and some of the debt was paid down. I put together a small spreadsheet showing the value of GPG using the updated cash figures, the updated debt figure and the market value of their listed investments. I then show two values, the mark to market asset value discounted by all liabilities which includes Coats' pension, and a value without Coats' pension. You'll understand later on why I have both values. The second figure 'Sum w/o Coats Pension' is the one we want to focus on first. The Coats pension is non-recourse to GPG, meaning if Coats went bankrupt GPG wouldn't be on the hook for the pension deficit. Just considering the listed assets GPG is trading at a nice discount to a readily realizable value. There is a bit of a sweetener, most of GPG's assets are selling at a sizable discount to a private market realized value. Management points this out, and an example is the case of Turners and Growers. Turners and Growers had a book value of £66m but was sold for £72m in the first part of 2012. The annual report states that management has no intention of liquidating their portfolio in a grocery store sale style, instead they will work slowly to realize a proper private market value. Their track record so far shows they are intentional and have been successful with this. In summary just looking at GPG's cash, and listed investments minus the top level liabilities this is already an attractive investment. With a current market cap of £389m GPG is selling at an almost 20% discount to fair market value. The market is strange, it's willing to offer £1 for 80p and throw in a profitable business for free. Not only that, but the company is working to give back the £1 and make sure the market knows how valuable the free business is. With this intro I bring you Coats. Coats is a thread manufacturer and they claim to be the market leader in textiles, industrial threads and crafts. I don't pay close attention to what yard in used in the clothes I wear, and I've never knitted so I'm completely unfamiliar with Coats. There are a lot of things to knock about Coats, a 4% net profit margin, a high debt to equity ratio, a loss in 2009, but none of these things make me think the company is going out of business or completely worthless. Coats reported a record profit of $71m in 2011, they have stated they expect 2012 to be lower, but still profitable. Maybe we'll see something in the $50-60m range like 2010. Even in the depths of the Great Recession Coats only had a slight loss and was in no danger of bankruptcy themselves. This is a good sign for me, when demand drops like it did in 2009 the company was still able to operate without issue. On a low end Coats is worth at least book value of £130m. 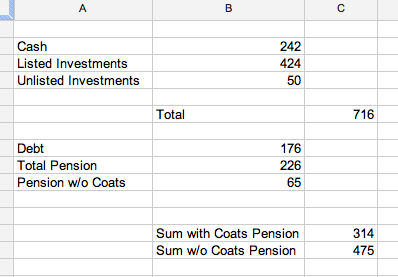 At a value destroying multiple of 8x applied to the average last three years of earnings I get £218m for Coats. I know GPG paid £400m for Coats back in 2003 and a reader who seems plugged into this said he thinks Coats could go for 5x EBITDA. If we use 5x operating profit instead of EBITDA for ease of example, and use the 2010 number because we expect profits to drop we're looking at a value of £383m for Coats which comes out to 22p per share. The pension deficit grew from £25m in 2010 to £226m in 2011 and investors are worrying this pension is going to grow large enough to swallow all of GPG. 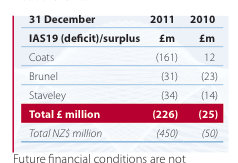 There are really three pension plans as shown, the Coats pension, the Brunel pension and the Staveley pension. Both the Brunel and Staveley pensions are recourse to GPG so the parent is on the hook for these. But notice that the revaluation between 2010 and 2011 wasn't that large for either of these pension plans. Management notes that part of the cash they hold at the parent is held against the deficits of the Brunel and Stavely pensions so it can't be returned to shareholders until Brunel and Staveley are divested. GPG has the cash to make both of these pensions whole today, I am discounting this cash in my calculations. The hope is that Brunel and Stavely will both be divested and set free without a large cash contribution to the pension, that's the best case. If that did happen it increases the upside a bit. The Coats pension is a different story, the revaluation is large and most of it is due to increased benefits not falling asset values. GPG has stated that they are working to make Coats a completely stand alone company and with that Coats is responsible for their own pension. They are already paying an excess £9m a year for 10 years to satisfy a previous deficit. The next evaluation of the Coats plan is in 2013 and unless the market rockets upwards it looks like Coats will be on the hook for further contributions. The good news is that even if Coats is required to double their contribution to £18m it's easily covered by operating profit. The pensions are worrisome but let's evaluate the worst case. I believe the worst case is that Coats suddenly goes bankrupt and somehow the court finds GPG liable for the pension. In that case we have GPG worth the £314m figure I noted in my spreadsheet above. This would be a loss of 20% for the investor at current prices. Of course there are more dire scenarios, maybe GPG can't realize the value on any of their assets, and they squander their cash while trying. This is always a possibility, but I cover this scenario by diversifying my portfolio. I'm not putting 100% of my money into the GPG liquidation. When looking at GPG it reminded me of another investment that I took part in recently CIBL, a company that wanted to liquidate a portion of their portfolio and they did. When I looked at CIBL I made sure I had a large margin of safety between my purchase price and the potential sale values. I have been looking for the same thing with GPG, and I think it exists. There is the potential for a small loss at the low end if a very unlikely dire and potentially impossible (legally) scenario unfolds, the sudden collapse of Coats. Barring that it looks like an investor here stands to make a profit. Disclosure: No position as of this writing, but I will be acquiring one soon. Thanks for the link, that was a really good article. My only comment on it is even if Coats is a marginal business they're surely worth at least book value or more. Right now the market is saying they're worthless. The fund manager quoted in the article claims they're hellish, yet I'm sure if he was given the shares at a cost basis of 0 he would take them. if I'm not mistaken Coats has a lawsuit of around £130mln by the EU(I guess), have you considered this? The lawsuit dates back to 2001, for collusion and market-sharing agreements. There are plenty of public documents available online from the European Commission if you want to read more about it. Coats appealed the fine when it was made in 2007. The European General Court will be making a decision on the appeal on 27 June (about 3 weeks away). To the best of my understanding, there is no recourse to GPG itself for the fine. It is my hope that the matter gets resolved at the European General Court soon as this is obviously significantly hampers any potential sale process of Coats plc. This is an excellent post. The only thing I worry about is that the mgmt could take ages to sell of Coats. Then you would be stuck with dead money. That is probably what the market is thinking right now. Yes there is the pending lawsuit which I'm aware of but didn't put in my calculations because GPG has a reserve set aside to pay the settlement if they lose. Management stated in the annual report the reserve should be able to pay for the settlement if they lose. ANd it turns out the reserve is not able to fully cover the settlement which they have just lost. Turns out this is a crucial investment assumption, i.e. Coats is really worth zero at this time, following the court loss. Another point I would like to add is the sensitivity of the pension plan to assumptions. Looking at the note on pension, for a 1% change in either the discount rate assumed or the inflation rate assume, the pension liability will increase by roughly 200m GBP (as stated in the note 10, pg40, 2011 Annual report). I could not find the breakout of this change for Coats, but even if 2/3 is attributed to Coats, the 1/3 left is still a very significant amount. In 2011, they decrease their discount rate but also decrease the inflation assumption to 2-3% (which we all know is unlikely to remain at that level for long with all the money printing). If inflation takes hold in the future and jump to 6-7%, Guinness will indeed be hit with huge pension obligations. Even though you made the point that Coats' pension is non-recourse to Guinness, in practice the obligation will likely impede and limit Guinness's options. Lastly, when I use the fully diluted shares outstanding, I get a market cap of 411m GBP instead of the 385m reported on services such as Google finance. I agreed with you that there's value here. However, reading from management's 2011 letter, I got the impression that they are taking the time, and will even add money to some business that have yet to 'mature' such as their Australian agricultural land investment or their Mongolian/Australian nickle venture. There's a real risk that they will sell some investments, return about half of the cash to shareholders after 2-3 years. Then, the pension obligation increases again, and then the share price will decrease even more, leading to a loss for shareholders even after accounting for the distribution. In conclusion, I believe this is not a bulletproof investment, especially since the pension is so sensitive to small changes in assumptions.